From conceptualisation to deployment, underpinned with outstanding metrics, implementation methods, and change management advice. We think outside the box. Apply a unique mix of standard lean methods and advanced business process improvement techniques in collaboration with your staff to deliver outstanding productivity and quality outcomes. Download a PDF summary of our Process Reengineering service. 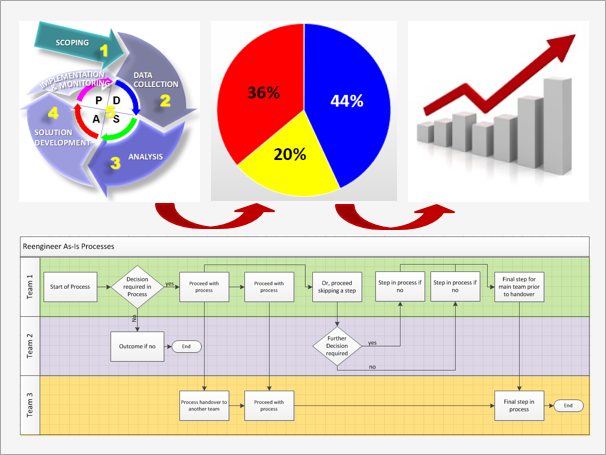 Bevington Group offers a unique mix of standard lean methods and advanced business process improvement techniques. Our consultants have unrivalled methods and tools at their disposal, and will work with your staff to deliver outstanding productivity and quality outcomes. Bevington Group personnel include many experienced and professionally qualified experts in lean process improvement who have successfully delivered process change to drive productivity improvements. The Bevington Group methods are unique in their ability to analyse processes quantitatively, in detail and at speed. Processes are how our clients bring ideas, services, and products to customers. Business process improvement delivers increased customer satisfaction, consistent delivery, and reduced costs. Our consultants bring pragmatic insights from the leading edge of outstanding practice in business process improvement. We can support you right through from conceptualisation to deployment, underpinned with outstanding metrics, implementation methods, and change management advice. From pilot phase to embedding practice, you need not deploy alone. However, where other organisations just stop there, we can go a great deal further. Our experience in business operating model design helps us to ensure strategic alignment of roles, customised to optimise your core business processes. Furthermore, we can train and accredit your own teams in lean business process improvement, to ensure sustainability of improvement within the organisation, and leveraged return on your investment. To learn more about business process improvement, please read our related Articles. Refer also to relevant Bevington Group Case Studies.